Did Brexit Help the Right Win in Spain? It certainly played a role—and the disappointing result should reignite debates within Podemos over long-term strategy. Approaching 11:30 on Sunday night, Pedro Sánchez, leader of Spain’s Socialist party, emerged from his Madrid election bunker smiling from ear to ear. “Despite the extraordinary difficulties we’ve had to overcome…despite the gloomy predictions that insistently announced a strong setback…and our loss of relevancy,” he told his supporters at the party’s headquarters, “the Socialist party has again reaffirmed its hegemonic position on the Spanish left.” Considering Sánchez’s attitude and the euphoria in party headquarters, one would be excused for thinking that the Socialist party had outperformed its electoral result in Spain’s December 20 elections, which failed to produce a workable coalition, thus leading to Sunday’s vote. But Sánchez’s party, in fact, lost five seats along with some 100,000 votes. The Socialists received only 22.6 percent (5.4 million votes) and managed 85 seats—both historic lows for the party. 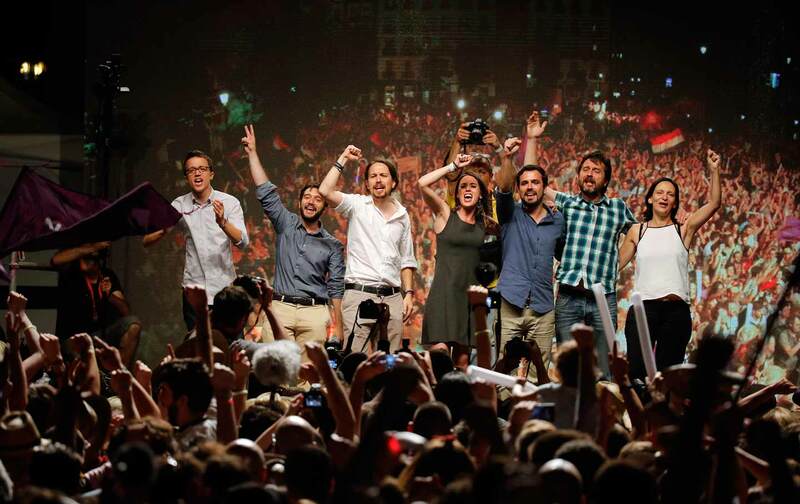 Like the Socialist party, Unidos Podemos suffered a disappointing electoral night, receiving 21 percent (5 million votes) and 71 parliamentary seats, the same number Podemos and United Left had achieved, separately, in December. Beyond ideological affinities, one of the main reasons for the coalition was to multiply the number of parliamentary representatives of the United Left, which in December received nearly a million votes but managed—thanks to Spain’s disproportionate electoral system—only two seats. On Sunday, the Unidos Podemos coalition instead lost a million votes. Every single poll of the last months, including exit polls on Sunday, had projected that Unidos Podemos would leapfrog the Socialist party—by as much as three points and ten seats—and perhaps land in the driver’s seat to form a governing progressive coalition. But the polls, which have routinely underestimated Podemos, this time went in the opposite direction, overvaluing the party’s outcome by some 20 parliamentary seats. The conservative Partido Popular won despite a seemingly endless chain of corruption scandals. The surprising winner on Sunday night was incumbent Prime Minister Mariano Rajoy. His PP, unexpectedly, was the only party to increase its seat count in parliament—from 123 to 137—thanks to more than 600,000 additional votes. As the night wound to a close, Rajoy greeted a sea of alternating baby blue and Spanish flags outside the party headquarters on Génova St., a stone’s throw away from Salamanca, the iconic bourgeois neighborhood—and conservative bastion—of Madrid. “This is the most difficult speech of my life,” he began, speaking at a little past midnight. Concerning the negotiations for his likely but still uncertain investiture as prime minister, he said, “We’ll speak with everyone.” PP supporters frequently interrupted him with cheers, even cannibalizing a famous Podemos chant, “Sí se puede!” (“Yes, It Can Be Done!”). But Rajoy ended on a curious note. “This party deserves some respect,” he said, less in the tone of an underdog puffing out his chest than of a grandfather scolding his grandchildren. Respect for the PP—despite its extraordinarily loyal and large base—has been difficult to come by, especially since the Gürtel case in 2009 unleashed a seemingly endless chain of corruption scandals that have so far included large-scale embezzlement, fraud, long-term illegal financing, and obstruction of justice. Earlier in the week, on Tuesday, the progressive news site Público reported that Jorge Fernández Díaz, Spain’s interior minister since 2011 and the head of the Catalan regional list for the PP, had in 2014 conspired with the head of Catalonia’s anti-fraud office to fabricate scandals against the leadership of the two major pro-independence Catalan parties. In the secretly recorded meetings, which took place in the weeks leading up to Catalonia’s referendum in November of that year, Fernández Díaz could be heard saying that Prime Minister Rajoy knew about—and presumably approved of—the conspiracy. The scandal was expected to deal Rajoy and the PP a significant blow in Sunday’s elections. Up until the first returns on Sunday evening, the Spanish left had plenty of reason to be optimistic. The timing of the revelations and their possible political repercussions drew comparisons to the Atocha bombing in 2004. In March of that year, three days before the general election, a bomb in Madrid’s Atocha train station killed 191 people. The PP’s José María Aznar, then prime minister, insisted that the attacks had been carried out by ETA, the armed Basque separatist group. The ETA connection quickly proved false; it was an Al Qaeda attack. Voters, angry that Spain had committed troops to the invasion of Iraq and convinced that the PP had tried to pull one over on them, swung dramatically. They elected the Socialist candidate José Luis Rodríguez Zapatero when, less than a week earlier, the PP had been leading by five points in the polls. Many on the left hoped that, as in 2004, this year’s damaging revelations—perhaps the last drop in an overflowing glass of PP corruption scandals—would yield a similar result. Instead, the PP actually increased its support in the regions most affected by the party’s corruption schemes: Catalonia, Valencia, and Madrid. The PP’s loyal base is demographically top-heavy, with 88 percent of its voters over 35 and 60 percent aged 55 or older. Their tolerance for the party’s corruption is matched only by their deep suspicion of the left—a culturally overdetermined distrust that was relentlessly fueled by the PP-controlled state media, which continually linked Unidos Podemos to Venezuela and, echoing the Cold War, to Soviet Communism. The British vote to leave the EU played a role, too, Noelia Adánez, a political scientist, says. “People didn’t fully understand Brexit, but it created an atmosphere of instability and uncertainty that drove them to the established parties.” Low voter turnout, at 69.8 percent, compounded the problem (turnout in Spain has recently hovered around 75 percent). The more than 2 million Spaniards residing abroad faced severe bureaucratic hurdles imposed by recent changes in electoral law, leading to a single-digit turnout. The lackluster results of Spain’s two largest parties on the left squashes the hopes of a strong progressive government poised to resist EU economic policy and build a southern European front against austerity. To be sure, an alliance between Unidos Podemos and the Socialist Party would have been difficult even if their combined seat count yielded a majority in Parliament. But now a progressive coalition would need the support of pro-independence parties from Catalonia and the Basque Country, the only two regions where Unidos Podemos—or anyone other than the conservative PP—came out winning. The Catalan and Basque formations would likely demand concessions regarding self-determination, a policy anathema to Sánchez and the Socialist leadership. Some have advocated a multiparty coalition among the Socialists, Unidos Podemos, and Ciudadanos—one aimed exclusively at ousting the PP. Such an agreement would yield an ample 188-seat majority but would require compromises, especially on economic policy, that none of the three parties are likely to make. Given Rajoy’s overwhelming victory this weekend, a continuation of conservative rule is for now more likely than after the December elections. The most likely coalition is between the PP and Ciudadanos—totaling 169 seats, only seven seats short of the 176 needed for a majority government. Such a coalition would still need to negotiate numerous abstentions to govern, mostly from pro-independence parties in Catalonia and the Basque Country. Rajoy would like to see a “grand coalition” with the Socialists, mirroring left-right agreements in Germany and the Netherlands. But Socialist leader Sánchez categorically ruled out that option during the campaign. Ciudadanos, meanwhile, has made it very clear that it believes Rajoy and his circle are too tainted by corruption to continue in power. Whether that position survives the pressure cooker of negotiations is another question. And, now, it appears that 7 million Spanish voters disagree. Rajoy, boosted by his triumph, will see little reason to step aside, much like Fernández Díaz, his interior minister caught red-handed plotting against his rivals, saw no reason to resign earlier this week. In fact, Rajoy doubled down on Sunday, celebrating the electoral outcome at the party’s balcony with Fernández Díaz by his side.